Bangalore based artist Sheela Gowda presents her first solo exhibition in the UK at Rivington Place, including a new commission. Gowda is known for creating large-scale sculptural installations which take everyday materials as the starting point and for works that combine abstract forms with references to society. The new work, of all people (2011), is made up of thousands of wooden chips, roughly carved by craftsmen into votive objects. They form part of a composition of larger frames and doors painted emerald green, peppermint, pink and off-white which also reveal the marks of weathering and infestation by insects. Moving through this environment, the viewer is invited to recalibrate their experience of the work from a number of different heights and perspectives. Collateral (2007) was made by rolling, arranging and burning incense on mesh frames to produce intricate patterns. This sculpture of ash has a fragmented and broken appearance which suggests a landscape ravaged by war. For this exhibition, the artist explores a new set of materials to produce a sculptural work for the large gallery space overlooking Rivington Street. While Gowda has participated in many curated group exhibitions, this individual appraisal is an opportunity for the artist to appear on her own terms. Having trained as a painter, Gowda diversified her practice in the early 1990s moving into sculpture and installation. Her visual language responds to the complexity of the contemporary world, including its violence and contradictions. Often she begins her projects by selecting a material and testing out its physical as well as conceptual attributes. What will the material do? How can it be transformed? What structures does it make possible? This often results in works pared down to abstract forms that remove the material from its social and economic context, but contain a residue of its source, which is made perceptible to the viewer. 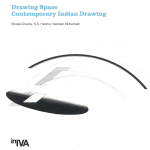 Gowda’s use of materials includes both an investigation into its physical qualities, as well as its source. In the work And tell him of my pain (1998), she produced a long cord from many individual threads passed through the eye of a needle, coated with glue and kum kum (a red dye used for body adornment and rituals). This becomes a coiling red line snaking around the gallery, invoking the internal organs of the body, the flexibility of a creeper, a Pollock drip painting and artisan labour. In Kagebangara (2007), Gowda sourced tar drums from road workers and used these alongside yellow and blue plastic tarpaulins to form an abstract sculpture, within which a narrative unfolds that refers to the shelters used by migrant construction workers. And Tell Him of My Pain 1998 Needles, thread, pigment and glue.